Piano Moving services in San Jose, Palo Alto, San Mateo and most of the Bay Area. Our professional piano movers in San Mateo are bonded, licensed, insured in California to provide you with the high quality piano moving service you need when transporting your families grand, upright, or console piano. Moving a piano is no small task; it’s an art that requires the experience of professionals you can trust. 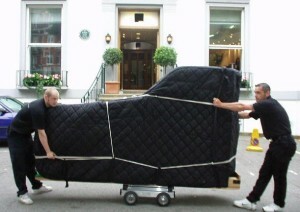 Let our team of reliable, experienced piano movers take the work out of moving your piano. The professionals at San Mateo Piano will give your piano the proper care during transit and ensure that your cherished instrument is safe and damage free. You can count on us to treat your piano like it’s our own every step of the way. To receive a quote, please call 650.376.3812 or fill out the online form below and we will get in touch with you shortly. Tell us when you need the service ? Please tell us how many turns? Baby grand shorter than 5'5"
Grand piano longer than 5'5"
Grand Piano longer than 6'00"